THIS WEEK IRELAND will send a team of 42 athletes to compete in the European Athletics Championships in Berlin. 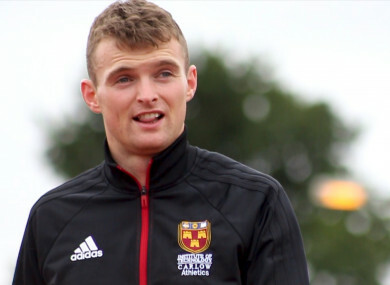 Irish athletics is hitting a sweet spot at the moment with recent successes at youth level and one of the athletes hoping to continue that success in the senior ranks is sprinter Marcus Lawler. Lawler became the second fastest Irish man over 200 metres three weeks ago in Cork, running 20.40 seconds – 0.10 seconds off the record set by Paul Hession 11 years ago. After having his season cut short last year with a hamstring injury, Lawler is back now and in the fastest form of his life, and fully intending to mix it with Europe’s best this week. – Updated 12.30: An earlier version of this article stated that Lawler ran 20.3 seconds in Cork last month; he ran 20.4. Email “'I have no fear. I can take on the big boys now'”. Feedback on “'I have no fear. I can take on the big boys now'”.